Posted in Latest News on 17th March 2017 by Dickinson & Morris. 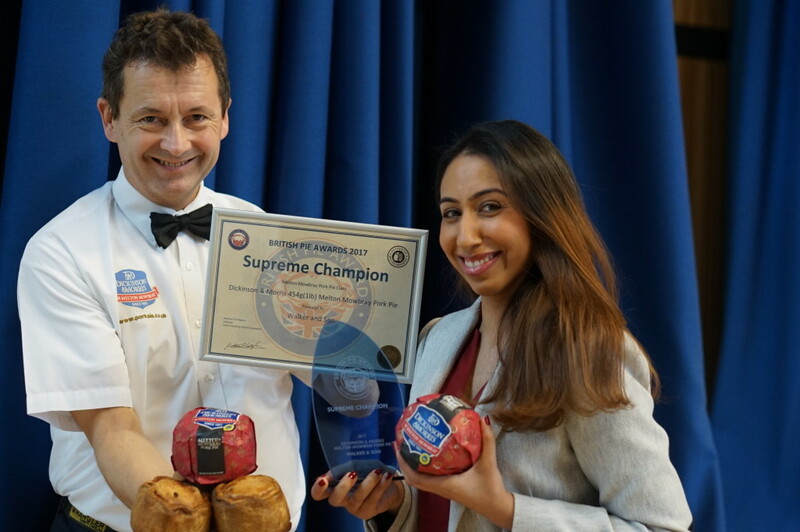 We’re thrilled to announce that our Melton Mowbray Pork Pie has been crowned pie of all pies having been named Supreme Champion at this year’s prestigious British Pie Awards. We hope you’ll take the opportunity to try our award winning creation (available here). Our Master Baker Stephen Hallam has shared his tips on how best to enjoy the taste experience of our Supreme Champion, like a champion! Tip 1: As with all Melton Mowbray Pork Pies, this pie is designed to be eaten cold. To enjoy it at its best, remove from the fridge an hour before feasting to allow it to approach room temperature. This naturally enhances the taste of the Pork Pie, ensuring your tastebuds are receptive to the delicate blend of flavours. 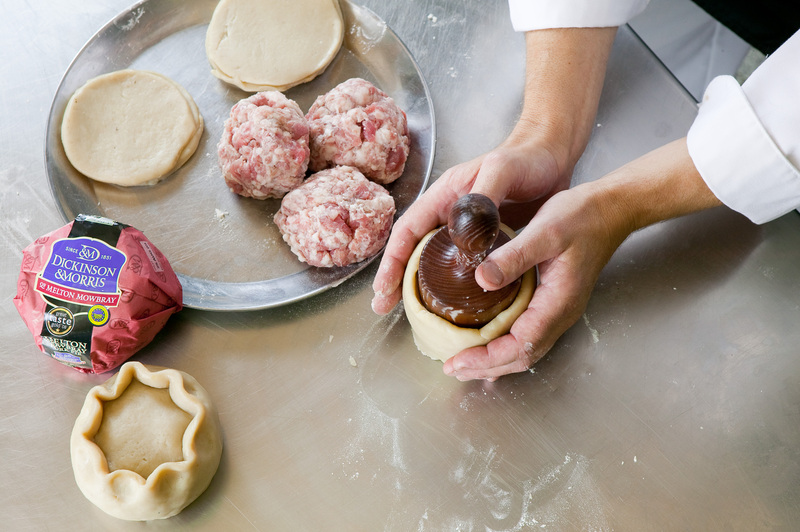 Tip 2: Slice your Pork Pie with a sharp knife which spans the diameter of the pie, using one firm motion. Do not employ a sawing movement, as this could cause the pastry sides to collapse (the horror!). You should feel the knife cut through the crunchy pastry at the bottom of the pie, and as it is cut open, it will release the cacophony of flavours and aromas typical of a Melton Mowbray Pork Pie; the succulence of British cured pork enhanced with high, spicy notes of white pepper, and the rich tones of the hot water pastry. Tip 3: If you don’t intend to indulge in your Pork Pie all at once, leave a portion intact and uncut to prevent moisture escaping. Keep the remainder wrapped in the fridge until a later date. If enjoying all at once, perhaps shared amongst friends and family, you will find that our Large Melton Mowbray Pork Pie can be cut into quarters, or even into eight bite size slices. Tip 4: Accompaniments for your Supreme Champion Pork Pie will truly be a matter of personal preference or seasonal slant. Purists may wish to consume theirs just as it is. However, if you’d like a little something extra to complement your pie, Red Leicester and Stilton cheese offer an obvious choice due to flavour combination and geographical origins. Pickles, chutneys and piccalillis can also add a tasty tang – click here to take advantage of our online offer, combining our Supreme Champion pie with Mr. Pitchfork’s Pickles Caramelised Red Onion Chutney, for just £5. In the height of summer, some Little Gem or Caesar lettuce leaves and a couple of slices of freshly-picked beef tomato will provide a refreshing accompaniment. Tip 5: The Melton Mowbray Pork Pie is a worthy partner to a multitude of tipples, and again accompanying beverage will be a matter of personal preference. Combine with the nation’s favourite, a hot cup of tea, for the ultimate home comfort. Or, if you’re in need of something a little stronger, a glass of local ale (we recommend Melton Red) or a fine glass of wine or even prosseco would not be out of place sitting alongside your Supreme Champion Melton Mowbray Pork Pie.